- The key here is to get the shape right. 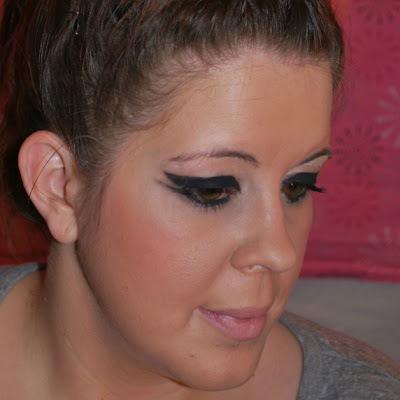 First plot the shape with black eye shadow, and fill it in with either pencil, gel/cream, or liquid eye liner or eye shadow. - I used all of the above mentioned products to achieve this look. - Use q-tips to clean up mistakes. Having a sharp edge is important. Have we told you to follow us yet? I didn't think so. Yeah, follow us.